Competing Google Assistant and Alexa-powered nightstand assistants are on sale today. 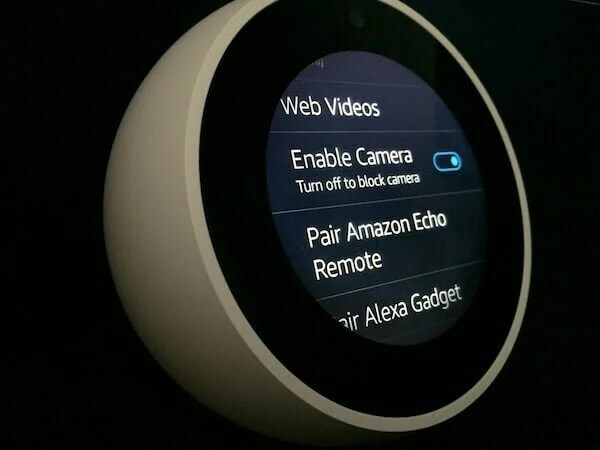 While I’m reluctant to bring the stylish Echo Spot into our bedroom, given its video conferencing camera, the full-color 2.5″ touchscreen is a source of frequent temptation. And, at a discounted $99, available in white or black, it’s not a bad deal for what is provides – including live video streamed from Ring, Arlo, and Wyze. In fact, you can bundle the Spot with a Wyze cam for a mere $5 more. Score? On the other end of the spectrum is the Insignia Smart Speaker, powered by Google. Matching it’s all-time low pricing of $20, there’s really no reason not to grab one… or more. I say this as an owner of two, purchased at higher prices, as sometimes all you really need is a clock appended to a small speaker. And if you’re not comfortable with an always-listening mic in your bedroom, turn them off using its physical button and schedule alarms from the Google Assistant app or use the Insignia as a decent-enough Bluetooth speaker. I’ve had the Spot as my alarm clock in the bedroom for a year. It’s cute and makes a good alarm clock, but it has limited important uses of the screen. I have my Spot now for a few weeks and while I have a few complaints / things I’d like to see improved, overall I’m loving it, and it’s replaced a much bigger, clunkier alarm clock. A face that shows Time / Date / Weather (current plus forecast) all at the same time rather than having weather be on a 2nd screen (which requires a 3rd screen – see next)…There’s more than enough real estate and that’s what a lot of us want to see. Ability to auto-scroll through screens without an “ad” screen that can’t be turned off to “see what you can do with Alexa”. I can look that up on my own – I don’t want it displaying a screen with zero useful information. Better smarts in Alexa – Is it really hard to know that “Alexa, shut the bedroom lights” (Alex responds ‘Bedroom lights doesn’t support that’) is the same as “Alexa, turn off the bedroom lights?” (Alexa responds ‘OK’). Those who grew up in the NY area will continue to say “shut the lights” and laugh when Alexa tells us she doesn’t know how to do that. Learn regional phrases. Well… we think we can disable the camera. But we’ve all heard stories of cameras, on various devices, that were supposedly off continuing to broadcast. Not to mention, Amazon still doesn’t allow us to edit our contact list. Can you turn off the Alexa tips? The Show has a bug where it doesn’t go off, irrespective of setting. IF the Spot had a USB port for phone charging (like the Insignia does, although super low power), I might be get over my camera concerns. Wonder why there’s no cheap Alexa clock like that Insignia. You can’t turn off tips and I’ve seen that’s a big complaint on forums. You can lock it to the first screen (time or time & date). There’s no USB port – would be nice, although I prefer wireless charging. Didn’t know about either of those. Hmmm… stop tempting me. :) Does it stereo pair to a 3rd gen Echo Dot at all and is it decent? Wife has the Insignia on her nightstand and I have the Dot on mine (plus a Tap on the dresser and another Dot in the bathroom). Cameras are simple to disable with a little electrical tape! Looks like you need the same device to stereo pair…perhaps a reason to get 2 (after all, I am an AMZN stockholder)? Google’s new Home Hub has a larger screen, no camera, does all kinds of goodness with a light sensor to automatically control the light output of the screen. Can do all the things Google Assistant can do of course. And is also widely on sale for $99 for the holidays. Personally I just use a regular Google Home for an alarm clock but if I was in the market specifically for that today at this money their new Hub has some nice features for that purpose. I do have a Home Hub… in my kitchen. It’s the perfect digital photo frame, and then some. Would also work well in an office/study. Not sure it’s right for my nightstand, but could see it appealing to others in that location. No way would I sully a beautiful piece of tech with electrical tape. Maybe Spot v2 will come with a camera cover like the Lenovo Smart Display. I wasn’t too interested in the home hub myself – though I have other Google smart speaker varieties all over the house at this point. I couldn’t think of a good use for the screen for myself personally. One thing I saw in a video review though was the multiple timer handling. That seems hella convenient on a screen. So now I am thinking about one for the kitchen. Jesse – was going to write in about the electrical tape, but you beat me to it. My other requested feature – don’t switch back to clock if I’m listening to music. I have it on my desk (I work from home) and have to engage the spot to see a song if it’s been playing for more than a few minutes. Even better – there’s no reason it can’t just have a small clock on the bottom. Dave – cut the tape in a small square. It pretty much disappears onto the spot.